When a major natural or man-made disaster takes place, the people of Ventura and the surrounding area rely on Zack Cohen and his disaster restoration Ventura experts with 911 Restoration Ventura to help them through these stressful times with clarity and confidence. Taking on the challenges of a disaster restoration Ventura situation means being to the scene of the even quickly before increased damages can set in, and that is why Zack and his teams can arrive within 45 minutes of any type of emergency call for help. “We are also available 24/7/365 to take on disasters of all proportions at all times of day, no matter what,” Zack explains. This level of access and attention to customer care is crucial when it comes down to saving a home from many of the different types of forms that disasters can take on. Disasters require not only a heightened level of skill and expertise, but also a compassion for helping people during their time of need, and this is why Zack and the disaster restoration Ventura crews always make sure to put the customer first in every situation. Don’t let a disaster unravel in your home without the help of experts in the industry. Call Zack and his teams of disaster restoration Ventura professionals with 911 Restoration Ventura and let them help with everything you need at an exceptional value today! Zack and his crews of disaster restoration Ventura experts have been at this for a while, and in that time they have learned to prepare for every kind of disaster that can possibly strike the Ventura area. “Commonly people think that the only types of disasters that might take place here are related to the ocean or earthquakes,” Zack says. “This is why my disaster restoration Ventura teams are mobilized with all the equipment that we need to take on the challenges presented by any disasters scenario,” Zack says. One of the most common disasters is flooding which can occur because of a severe storm that happens miles away from the eventual flood plain. Never underestimate the power of the weather to produce disastrous events that can flood out your home unexpectedly. Always make sure to keep a disaster restoration Ventura professional at hand to help solve the challenges of these situations. Give Zack and his disaster restoration Ventura staff with 911 Restoration Ventura a call today and make sure that your home is going to be taken care of by the best should a disaster ever occur! Zack and his teams of disaster restoration Ventura specialists are always ready for any kind of situation that springs up, and this has produced some interesting and profound challenges over the years. When hardwood is saturated it can absorb huge amounts of water and swell up which then buckles certain sections of the flood and makes them very difficult to repair. 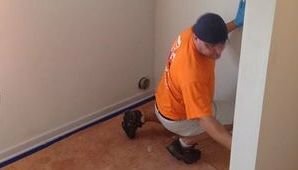 Zack and his crews took on the water with ease, and then after the home had been dried out, they eliminated the excess moisture from the area and began the process of making the hardwood look like new again. Don’t let your home’s hardwood floors get buckled from a flooding unexpectedly. Contact Zack and his teams of disaster restoration Ventura experts with 911 Restoration Ventura and let them help with all your restoration needs today!